The Navy Goes to Houston - Go Navy Go! It seems like we’ve had more than our fair share of hurricanes this year. Harvey, Irma and Maria and the Atlantic hurricane season isn’t over until the end of November! Since my home and business are in Houston, Harvey was a first-hand experience. It came ashore as a category-4 hurricane with winds of over 130 MPH delivering 2-4 feet of rain. It killed over 70 people, flooded over 200,000 homes, had a 12.5 foot storm surge and it caused widespread power outages. It was an inspiration to see how people pitched in to help. Neighbor helped neighbor. The incredible Cajun navy from Louisiana came to help with the rescues. Power companies from a number of states came to help restore electricity. The Texas National Guard was assisted by her sister units in other states. FEMA was there. The Red Cross and other aid agencies were active. What didn’t get a lot of coverage was the support provided by the U.S. military – including the Navy. I recently read a good article in Time magazine on this that you might also enjoy. The military deployed over 23,000 personnel to help. They sent the U.S.N.S. Comfort to provide ready-to-go hospital facilities. They deployed six MH-60 Seahawk helicopters and four MH-53 Sea Dragon helicopters to assist in the search-and-rescue efforts. USS Kearsarge was deployed. It’s an amphibious assault ship that was used to transport relief supplies. She was accompanied by USS Oak Hill to transfer supplies to the Texas docks. 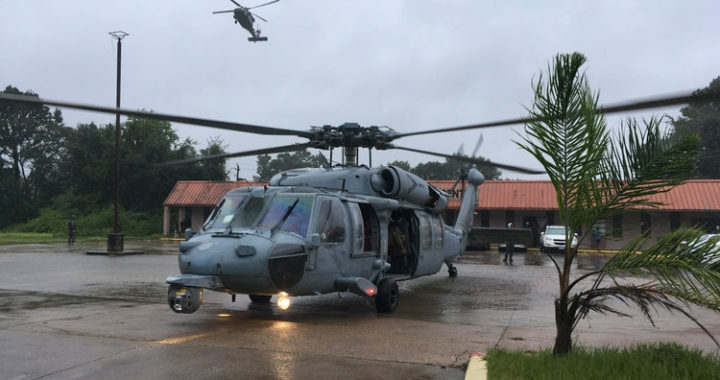 There’s a great Department of the Navy article titled Navy Squadrons Rescue 227 on First Day in Houston that provides additional detail on the Navy’s efforts. If you’ve been following my blog posts, you know how incredibly proud I am of America’s Navy. I’m also proud of the people of Houston and loved watching them team up on this very important mission.